This is a scarce first edition of John Thomson’s 1817 map of the southeastern part of the United States, with outline coloring. The map covers from the Mississippi River eastward to the Atlantic, extending north as far as Lake Erie, and south to northern Florida and the Mississippi River Delta. The states of Pennsylvania, New Jersey, Maryland, Delaware, Virginia, Kentucky, Tennessee, North Carolina, South Carolina and Georgia are illustrated in full. Ohio, Illinois, Florida, Alabama, and Mississippi have yet to appear as either states or territories, and Florida was not yet part of the United States. Thomson prepared the map during a transitional period of expansion shortly following the American Revolutionary War. It is among the most thorough treatments of this region prior to U.S. Government Surveys. The map displays detailed treatment of American Indian activity between the Mississippi River and the Appalachian Mountains, with American Indian nations noted throughout including Creek, Seminole, Apache, Choctaw and Chickasaw, among others. Much of the territory included was under the control of indigenous peoples. Hunting grounds, villages and fortifications are identified, in some places accompanied by the date on which they were destroyed. Thomson identifies the Wabash Company, the Jersey Company and the Illinois Company - joint stock ventures formed during the colonial period to acquire, sell, and colonize American Indian lands. Along these commercial lines, some coal mines are also noted on the Illinois River. Also worthy of note is the mountain range in northern Ohio – occupying an area which in reality is quite flat. Also included is a scenic vignette of the Hudson River in the upper left quadrant labeled ‘Characteristic Scenery of the Hudson River’, which resembles the Palisades of the Hudson. 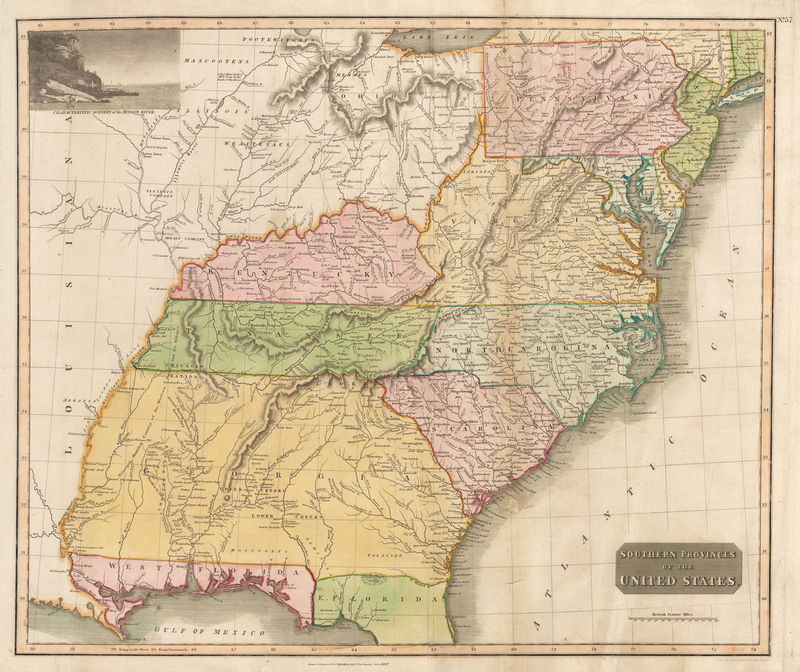 This first edition of Thomson's southeastern United States map is from the 1817 edition of his General Atlas. Though the first edition of the Atlas was published in 1814, it did not contain this map, which was issued in the 1817 edition. A subsequent edition appeared in 1826. Condition: This map is in B condition. Repairs to the map have been done in archival material on the verso, with a hole repaired in the Atlantic just off the coast of South Carolina and repairs to a few edge tears. There are some fold creases. Despite these issues the map will feature nicely when framed.